It can hold laptop power supply lead, mouse, cables, chargers and etc. Carry your laptop/ultrabook power adapter lead and mouse the easy way. 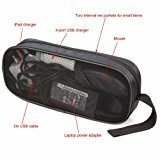 This universal laptop power adapter bag provides a flexible organisation solution for your laptop accessories. It helps make you better organised with the power lead, mouse, various chargers, cables, USB pen drives, memory cards and etc.. It can also serve as a travel checklist. Before you leave a place, just take a quick look to check if everything is there, preventing you from leaving things behind.